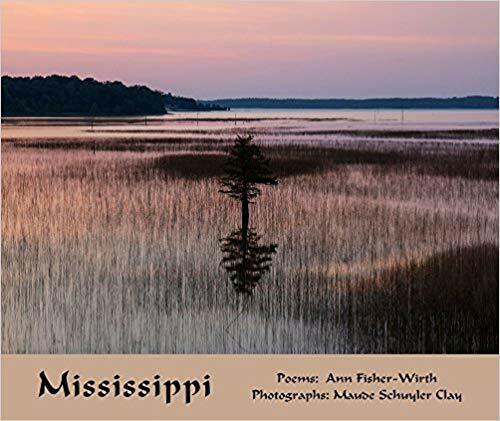 Poetry Flash, an online publication that reviews poetry, did a review on Senior Fellow Ann Fisher-Wirth’s book of poetry Mississippi. The review, written by Iris Jamahl Dunkle is below. Here is the link to the original article. TERRY TEMPEST WILLIAMS WRITES in her breakthrough essay, “The Open Space of Democracy,” when we experience something fully, it opens us; it “creates a chasm in our heart, an expansion in our lungs…We breathe deeply and remember fear for what it is—a resistance to the unknown.” Mississippi by Ann Fisher-Wirth and Extra Hidden Life, among the Days by Brenda Hillman are two stunning new poetry collections that offer us poetic duets with complicated experiences. One collection immerses us in the complex landscape and history of Mississippi as presented in the haunting photography of Maude Schuyler Clay, while the other collection takes us on a journey through the impossible cartography of grief and the ethics of active resistance. Both poets fill their lungs with long form responses. Mississippi is a forty-seven-part poem; each part paired with a different photograph. Extra Hidden Life, among the Days engages topics through theme-based sections and series, most stunningly in the two elegiac sequences: “The Rosewood Clauses” and “Her Presence Will Live beyond Progress.” But also in extended meditations about the world around us: trees, bacteria, wasps, buildings, elk, roots, and stars. In both of these collections, the reader learns by taking deep breaths, and by looking closely into the unknown. In Mississippi, the speaker is a collective consciousness, mostly many specific voices, reminiscent of William Carlos Williams in his epic poem, Paterson [published in five volumes from 1946 to 1958]. But while Williams’s poem strove to find “the resemblance between the mind of modern man and the city,” Fisher-Wirth’s poems strive to find the resemblance, the relation between the modern person and the natural environment in which she/he lives. Clay, who is a native of Mississippi, has been photographing the landscapes of her state since 1993. Clay’s photographs of cottons fields, apples on window sills, or a wide, green river hemmed by trees are almost entirely devoid of humans; however, Fisher-Wirth’s lyrics pencil in the story of the people who could have inhabited those places. In another poem section, paired with a photograph of a tangle of trees sunk knee deep in a swamp, the ghosts of the past rise up when the speaker recalls how “some say the dead/ hang round here/ reach up through the water/ drag you down.” (page 52) It is as if the place has absorbed all that has been done to it, and all that has been done to the people who lived on it. These poems tap into that deep well of truth. The landscapes show us what we have done: the severe environmental degradation, the poverty, and the racial oppression, “this is how history plays you/ mountains, empires/ crumble to dust.” (page 92) Fisher-Wirth, who co-edited The Ecopoetry Anthology with Laura-Gray Street in 2013, is no stranger to writing about our relationship to the other-than-human world, and these poems exemplify this connection. The final poem is paired with a “husk” of a one-room house set in a muddied field next to a line of “winterbare trees.” In this place of seeming poverty, light still rules, still “shines through walls/ from which boards are missing…Light snakes away from the house/ in watery furrows.” In these last moments of the book, the reader is again asked to enter the scene, to “look,” to keep looking at this complex landscape until we see. The thing about Paterson is that through documentation William Carlos Williams somehow captured the natural landscape, and the daily human life lived in a city in a kind of time capsule that still reverberates today. In the same way, Fisher-Wirth’s poems offer us a complex artifact: a palimpsest of human and natural history written on the damaged landscapes we see pictured in each haunting photograph. Through her poems and Clay’s photographs we see a deep view of Mississippi that we may have never been able to see. Poetry that invents, that challenges the limits of language by using it in new ways, is often accused of being without lyric intimacy. Hillman’s lyrics, however, both bend language and tap into the lyric intimacy of what it means to live in this world. Even more importantly, Hillman writes about what it means to live in this world as a woman. In “Curl of Hair in a Drawer,” Hillman draws upon this heritage as she remembers visiting Sylvia Plath’s archives “like a pilgrim tracking relics of a martyr” and finding in it the relics she was seeking: Plath’s baby book and a curl of her hair. Hillman recalls how Plath wasn’t liked by some critics because she wrote with “too much emotion or too much motherhood,” and a solidarity emerges. She realizes she is nearly the same age as Plath was when she died and that they had things in common (besides poetry): “…mothers who made baby books; small children;/ depression in the overwhelm; perfectionism.” But that in the end, Hillman “love[s] to write” more than she “love[s] sorrow…The somehow is endless, the details are endless & language is/ endless so i lived.” Hillman acknowledges how her foremothers like Plath fought against the grain of what it meant to be a woman poet writing about the unique perspective of her life in a male dominated poetry world and what that cost. Indeed, Hillman’s collection writes what we want to read: A book that resists the unknown by inventing a way to write about it. Linguistically inventive at the same time that it is personal and lyric, Extra Hidden Life, among the Days opens us as readers to a new way of understanding what we do not understand. Both these collections become physical places that the reader can inhabit. Mississippi is a poem about place; but also, a poem about listening to the palimpsest of voices (the natural and the human) that have lived in that place. Extra Hidden Life, among the Days is like lichen covering a live oak. It’s a book that tells the secrets about things we pass by, forget to see. It’s the story of swallowing the stone of grief and somehow finding a way to push up from the depths you’ve sunk to and emerge through skin of water back to the air. You will treasure the hours you spend wrapped in these works learning to breathe into the unknown. You will learn a new language to speak about what you fear. You will learn a new language to speak about what you have not yet been able to see until you were taught to look closely. Iris Jamahl Dunkles’s newest book of poems is Interrupted Geographies. She is a former Poet Laureate of Sonoma County. Her previous collections of poetry include There’s a Ghost in this Machine of Air, about the untold history of Sonoma County, and Gold Passage, selected by Ross Gay for the Trio Prize from Trio Press.